Stephen Hawking's Plan For Interstellar Travel Has Some Earthly Obstacles : The Two-Way The theoretical physicist is part of a team that wants to send postage-stamp-size probes to our closest star system, Alpha Centauri. But can they get the proper permits? 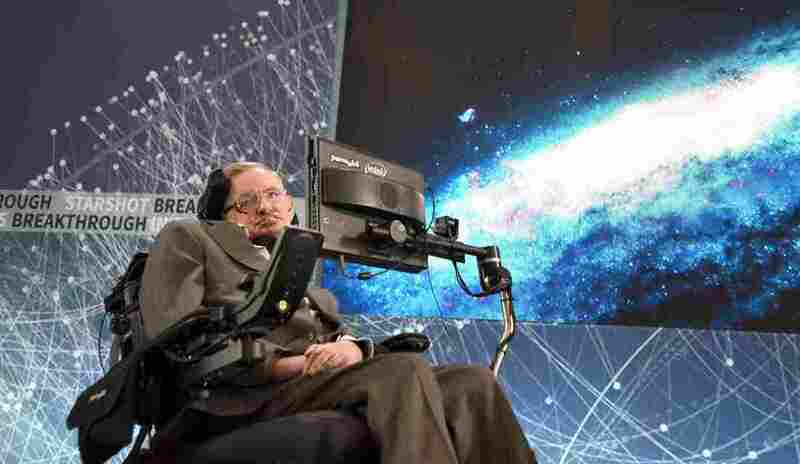 Stephen Hawking discusses the "Breakthrough Starshot" space exploration initiative during a news conference Tuesday at One World Observatory in New York City. The plan for "Breakthrough Starshot" laid out at the news conference looks both ambitious and exciting. But if it's really going to work, there are several down-to-earth problems these would-be star trekkers will have to overcome. Do You Have A Permit For That Planetary Laser? Starshot's tiny probes are supposed to be given a big push by a mammoth 100 gigawatt laser back on Earth. A laser that powerful could also fry anything in its path, including orbiting satellites. "If somebody says, 'Hey look, I'm concerned about you hitting a potential satellite,' " says Pete Worden, the project's leader. "We won't fire when it's in the way." Worden admits the people of Earth are unlikely to take the Starshot project at its word. "We anticipate that there would be international agreements in control of this," he says. The team will work with all countries to get the necessary permits in order. Once the hundreds or thousands of probes leave our solar system, they would be on their own in more ways than one. Physics dictates that communications between Earth and the probes can't happen faster than the speed of light. That means if one of the probes runs into trouble a light year into its journey, then it will take a year for its distress call to reach home. It will take another year for mission control's instructions to reach the little craft. It's safe to say that in the two years it takes to get help, the probe will have either fixed itself or died. Milner, the Russian entrepreneur, has put up $100 million of his own money for the project. That sounds impressive, but in the space business, it's peanuts. The New Horizons probe that zipped past Pluto last year cost $722 million. Pluto is 3 billion miles from Earth. Alpha Centauri is 25 trillion miles away. In other words, getting 0.012 percent of the way to Alpha Centauri cost seven times as much as this week's pledged funding. Milner acknowledged this, but hopes his seed money can get things started. 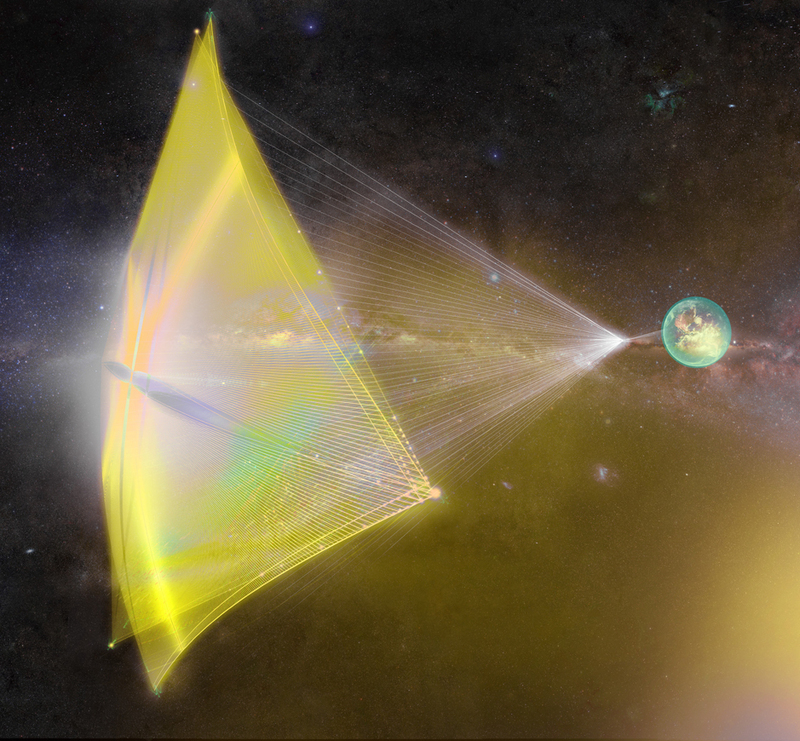 The "starchip" would be about the size of a postage stamp, Yuri Milner says, and the sail would be about a yard across. Thus far, humanity has managed to send only one craft into interstellar space: the Voyager 1 probe, launched in 1977. In the time it's taken to get out there, many of the scientists and engineers involved in the program have moved on, retired or died. While Starshot hopes to make its journey in two decades, Milner admits it will take "a generation" to prepare for the trip. Keeping a workforce going for that long, and making sure that key knowledge about the complex project isn't lost along the way could be the final frontier — of the HR department. How Does ET Phone Home? Experts agree there is no proven technology that would allow something the size of a postage stamp (or even a cellphone) to send a signal across trillions of miles of interstellar space. Figuring out how to do it is a top technical priority for the Starshot team, and perhaps its most important challenge. Without a reliable way to send pictures and data home, the entire mission could end in failure, warns Bruce Betts, director of science and technology for the Planetary Society. "If you could fly to a forest, and you could see a tree fall, but you can't mention to anyone, did it really matter?"